As a potter living in Key West, my ceramic art is influenced by what I see every day biking and paddling around this beautiful island. The colors, vistas, quality of light, archtecture and the critters of the Keys are my inspiration and have led me to call my current body of work "Keysware". Jane Grannis has called Key West home since 2006 when she moved here after retiring from a teaching career in New Jersey that spanned 35 years. As an art educator and administrator, she taught everything from college to kindergarten, primarily focusing on high school ceramics and crafts. She also served as the President of the North Jersey Designer Craftsman and as the Co-Chairman of the North Jeresy Student Craftsmans Fair. While teaching, she earned MAs in Fine Arts Education and Administration. 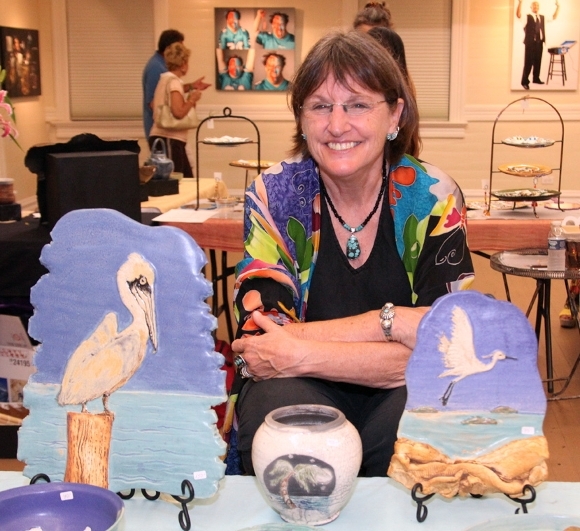 She also worked as a studio potter, selling her work at craft fairs and galleries. As the demands of her educational career grew, her pottery output diminished. It is with great joy that she has been able to get back to working with clay, being influenced by a whole new set of visual references from her new home.